The bright lights of Las Vegas just got a little brighter. Up and down the strip, hotels are adding digital signage, and not in forms of marquee signs or flashier casino games. This time, the larger-than-life lights are everywhere, from the reception desk in the lobby to kiosks and terminals sprinkled throughout the properties. Digital signage is entering new arenas, and cities like Las Vegas are leading the way with unique implementation of the latest technology. The proliferation of mobile devices coupled with social media introduced interactivity to digital signs. They no longer convey relatively static information, but rather facilitate a give-and-take among all who view them. Visitors to Las Vegas expect a wow factor, and the addition of interactive digital signage has been well received. Cross-platform integration, digital wayfinding and mobile integration are all features that are delighting tourists on a daily basis. Video walls effectively engage large crowds, but smaller displays can be just as engaging. Consider the more than one dozen screens and kiosks the Flamingo uses in conjunction with support for personal mobile devices. It may not be a single message on a 30-foot-wide wall, but the platform integrates all the smaller displays through an interactive digital network, which offers information that can be tailor-made for the individual consumer. Access to Caesars’ Total Rewards Card loyalty program at key points throughout the hotel and casino increases the value of this service. That is not to say that a video wall lacks engagement. The video wall at MGM Grand combines 48 displays and offers an impressive view. The wall is used to promote events while featuring a live poll. The displays themselves are near seamless with bezels fading from view. The sheer size of Las Vegas often leaves people disoriented; what seems like a few blocks away can often lead to a mile of trekking down the Strip. Now, step-by-step walking directions added on the basic map views streamline navigation. People can access them via smartphones and other wireless devices. The level of detail for images is rising, featuring 3-D depictions of building layouts, more accurate representations of floor plans and more realistic route details. Digital wayfinding offers a plethora of details about various destinations. Want to find Chicago-style pizza? Just peruse pizzeria menus until you find the deep dish you crave. Trying to remember the one shop that had those shoes you like? Using multi-touch technology, users can zoom in on product offerings to confirm those red pumps are the ones you saw while passing by. All of this is made possible by the marriage of smartphone applications and digital signs. QR codes, audio-recognition software and even the humble SMS allow for detailed information to help people get around. Most importantly, this information stays with people and their devices, replacing written directions with digital convenience. Testing is already underway on ways to send special offers, information and multimedia to users via mobile phones and other wireless devices. The process has centered on individuals already connected to the hotel or casino via an affinity card or other user registration. One possible scenario is to interconnect existing loyalty programs with wayfinding software to help guide players to lower-traffic areas with their favorite casino games. Over time, user habits and other information can help the casino match ideal products and services to individual patrons, in terms of travel, food and entertainment, from the moment they check in. In addition, users who express interest in certain amenities and activities while viewing information via a kiosk, terminal or mobile device could receive a coupon code or other promotional offer. 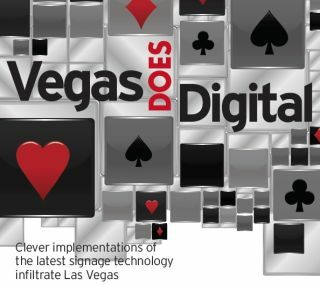 The cutting-edge digital signs in Las Vegas won’t be considered high-end innovations for long. Widespread adoption is just a matter of time as technology continues to grow and new methods of satisfying customers surface. The house always has the advantage in Vegas, so bet on leading hotels to win over more customers with new sign applications.